Jaguar’s XF has cleaned up at the annual SME Company Car of the Year Awards, claiming the two headline gongs. The upmarket large executive cruiser was named Company Car of the Year and Large Company Car of the Year after a panel of independent judges praised the XF 2.0D 163ps R-Sport Auto model for its handling and technology. Its low running costs were also a major deciding factor, with the XF’s four-cylinder diesel Ingenium engine capable of delivering a combined fuel economy of 69.7mpg and CO2 emissions of 109g/km, which drop to 104g/km in manual models. This marks the second year running that the XF has come away from the awards with a prestigious award – it was named Director Company Car of the Year during 2017’s event. 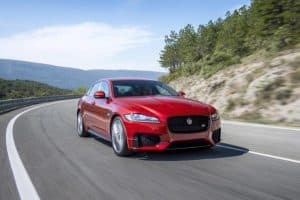 Other publications have recognised the XF’s superiority in the company car market with Business Car and Fleet World separately naming it their Executive Car of the Year, while Top Gear Magazine hailed the XF as Saloon Car of the Year. Reacting to the win, Jaguar Land Rover UK’s managing director Jeremy Hick said this latest award was yet another “validation of what we’ve known about the XF from the beginning; it is quite simply the best all-round package in the executive class”. Molly Benton, brand manager at Fuel Card Services, went on to say: “The company car market is vast, varied and fierce in equal measure and every manufacturer likes to think their models are the ultimate company cars.